With 1920’s fashion fever sweeping modern wedding planning lately, there is no wonder why halo rings have become so popular. Many women adore the elegance and grace of the clothing and jewelry from the 1920’s, and they want to incorporate that look and feel into their own lives. Many women want to know, “What is the best kind of wedding ring to wear along-side a halo ring?” The answer is quite simple: a diamond eternity ring. This three row pave diamond eternity ring would love flawless paired with a halo engagement ring. engagement ring, eternity wedding bands with pave diamonds are the perfect solution. The pave diamonds match each other perfectly and they both have an antique look and feel to them. 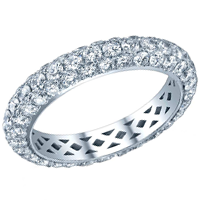 A diamond eternity ring is quite the masterpiece of wedding jewelry. The diamonds are encrusting the wedding band the entire way around the ring, which is not only lavish, but incredibly stylish. The many small diamonds create brilliance and shine in a way that no other piece of jewelry has to offer.